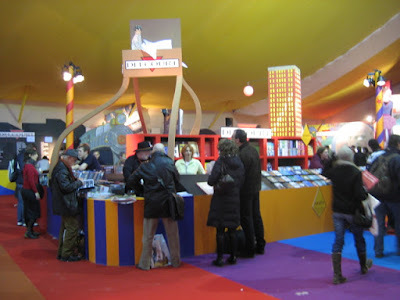 I’m just back from a great trip to France, where I attended the Angoulême International Comics Festival and also spent a few days in Paris with an overnight visit to Lyon in the middle. 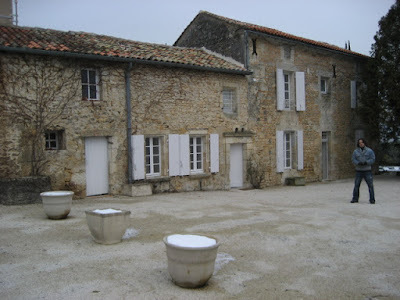 This post features photos from the Angoulême portion of the trip. 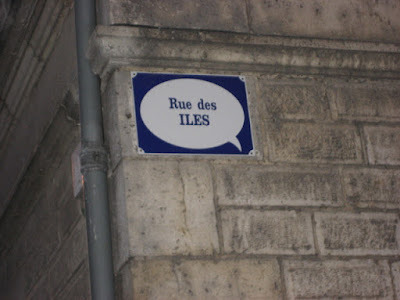 Even as you arrive in the city of Angoulême you start to see signs of comics’ presence all over, including the street signs. As documented elsewhere (check out The Comics Reporter or Journalista for links to other photo reports and reviews), Delcourt, who published La Perdida, also recently published Sunday Press’s giant Little Nemo book. This is a view of their booth with a giant Nemo bed towering above. 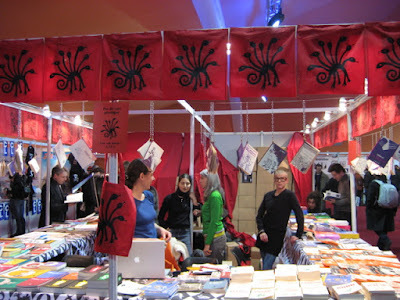 For a change of scale, here is the L’Association booth, where I spent a bunch of my time signing 99 Exercices de Style. From left to right you can see L’Asso staff members Céline (who did the amazing re-lettering of my book), Fanny, the artist Caroline Sury, and Charlotte (who translated my book). Alvin Buenaventura, Jordan Rae, and Dan Zettwoch at the Buenaventura Press. I was disappointed with how out-of-the-way the fanzine tent was, it was kind of off to your right as you navigate the throngs of fans lined up for dédicaces seated in their little folding chairs. Alvin seemed to have the best spot though: as you were walking past you could make out Kramers Ergot and other goodies in the distance, pulling you toward the fanzine area. Jessica and I stayed in a funny little hotel converted out of old farm houses and situated by a golf course on a hill overlooking the city. That’s Jeff Smith you can just make out in the photo. He and his wife Vijaya stopped by for one day on their way to India. 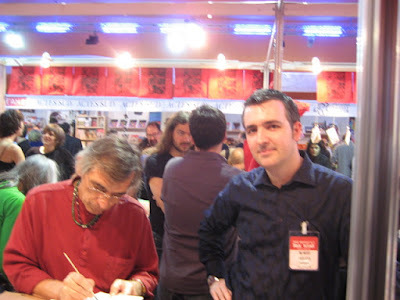 Here I am at one of my moments of glory: signing books next to Edmond Baudoin! Baudoin was a marvel to watch, he would do a leisurely fifteen minute sketch while he held forth on his philosophy of drawing. 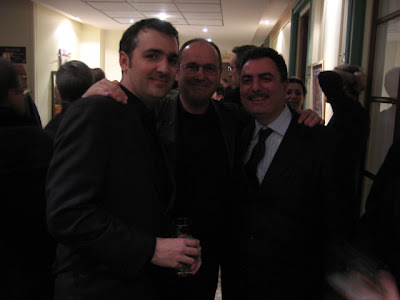 He also started to talk up my book to his fans and got me a bunch of sales–merci Edmond, je te dois quelques verres! The Woodring family at the awards ceremony. Woodring père flanked by Max and Mary. Jim’s show of originals at the CNBDI (Angoulême’s comics museum) was stunning. One afternoon Peter Kuper and I spent a good long while with our noses pressed to the glass trying to figure out how he does it. 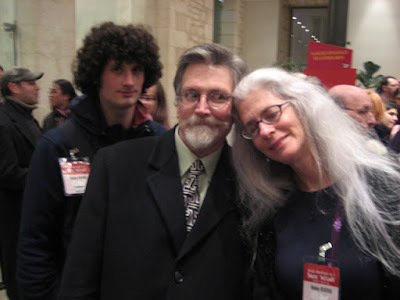 When you see some art in real life you instantly notice all the imperfections, patches, and smudges that don’t show up in reproduction (not necessarily a bad thing, I should point out)–not so in Jim Woodring’s case. 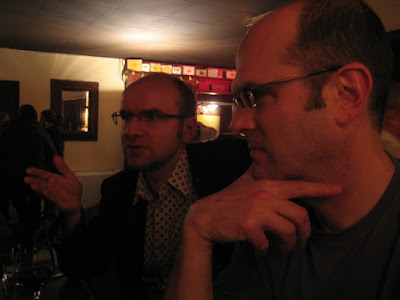 At dinner after the Saturday evening awards ceremony with, on the left, Monsieur le Président Lewis Trondheim, an amazing dynamo of energy and charisma, and recent award winner Charles Burns. It’s Sunday morning and things are winding down. 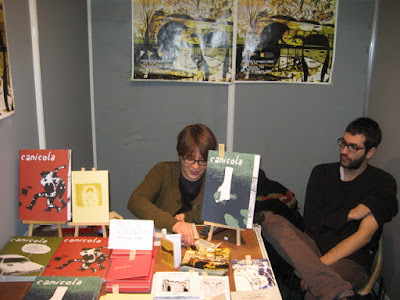 On a last trip through the fanzine tent I find Amanda Vähämäki (of Campo di Babá fame) and Alessandro Tota at the Canicola booth. 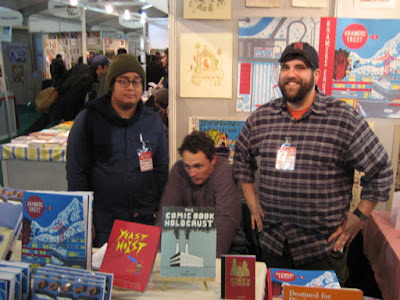 Congratulations to all of them for winning the Angoulême fanzine prize. 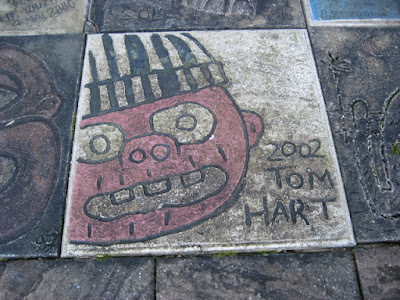 In the front courtyard of the CNBDI there are a bunch of maybe 20″ square cement slabs that have been drawn in by a wide variety of artists, including my good friend Tom Hart, whose slab was quite prominently featured. Up next, photos from Paris and Lyon. I’m not as meticulous as some more journalistically-minded bloggers when it comes to details, links, and context, so feel free to ask questions in the comments field. thanks for the photo with my brother Chuck. That’s a great famiy portrait of the Woodrings!